Here’s a sneaky (and welcomed) little change that a few of you have tipped us on. It seems yesterday’s AT&T Lumia 920 firmware update, which will be going to other Lumias in the near future, is also sporting a few changes for the display time-out (found under Settings > Lock Screen). 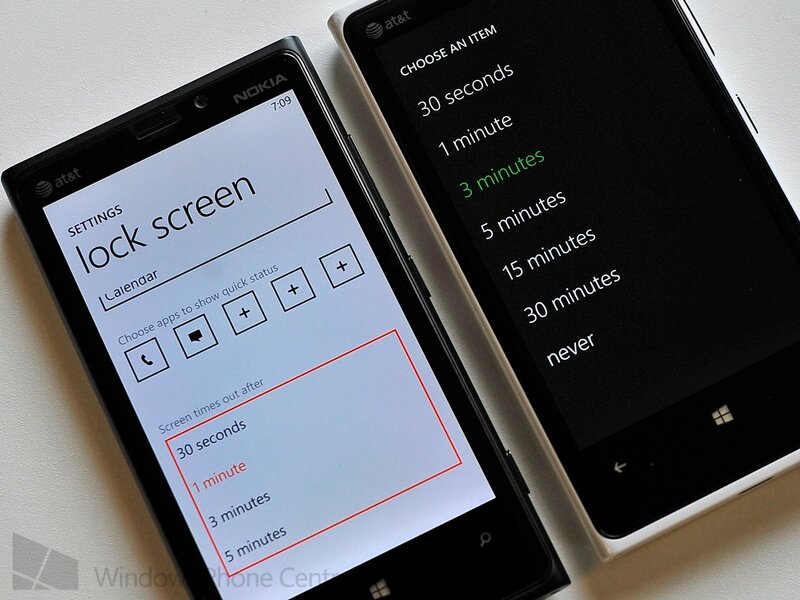 Currently, some users on a few Windows Phone have only four options: 30 seconds, 1 minute, 3 minutes and 5 minutes. The choice determines how long your device will sit idle before the screen powers off (we opt for 3 minutes ourselves mostly due to photo and video shoots). Now, with the 1308 firmware for AT&T new timings have been added including 15 minutes, 30 minutes and Never. While we imagine not too many of you will need to take advantage of such lengthy time-out options, it’s sure nice of Nokia to give users the choice in the matter. We can think of a few instances where we would want the display to either stay on for longer durations or not turn off at all. In general, this seems to be part of the trend of Nokia to give users more options with their display. A future systems update is expected to enable a color-profile selection, giving users the ability to manipulate the color intensity of their Lumias—a first for Windows Phone. Related: You can see our video demonstration of the Storage Check feature found in the latest firmware here. Thanks, Farnic, for the tip!